Gear Guy: What are the best new putter grips? Yo, Gear Guy! 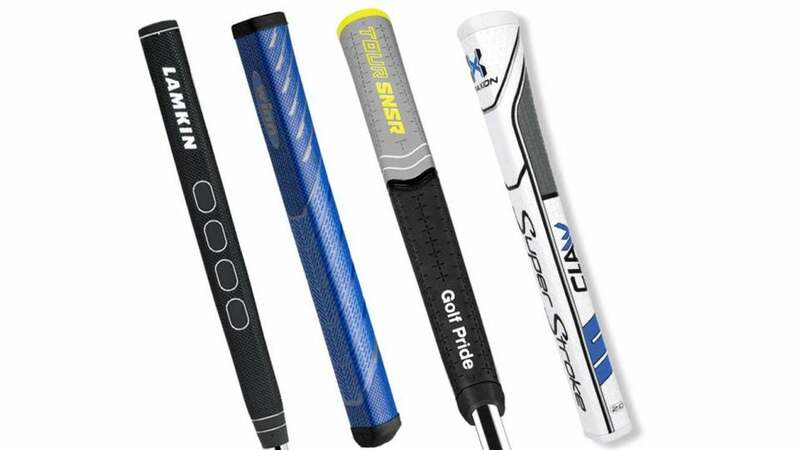 What are the best new putter grips? From left, the Lamkin Sink Fit, Winn NTP, Golf Pride Tour SNSR Contour Pro and SuperStroke Traxion Claw. Welcome to another edition of Yo, Gear Guy!, an interactive GOLF.com series in which our resident dimplehead (a.k.a., GOLF’s deputy editor of equipment, Mike Chwasky) fields your hard-hitting questions about clubs, fittings, gadgets, bounce, lofts, CG, MOI, and a bunch of other scary acronyms. This week he breaks down everything you need to know about putter grips. Charleksteen on Instagram: I’m in the market for new putter grips. What brands do you recommend I give a look? Since putters and putter grips are among my favorite equipment-related topics, I suppose we’re “on a roll,” so to speak. In all seriousness grips in general are one of the most overlooked areas by players looking to improve their scores and putter grips in particular are probably the loneliest of gear categories. Why, I couldn’t say, as anyone who’s ever experimented with putter grips knows well that changing one can mean a given putter immediately feels and often performs like a completely new one. For that reason I’m a big proponent of trying new putter grips when your trusted flatstick stops working rather than immediately ditching it for an entirely new model. One word of warning — if you’ve got a proven putter that simply cools down for awhile be careful about re-gripping; once you take the original off it’ll be hard to recapture that old feel. Building on the TOUR SNSR line, the new Contour Pro features a Tour-preferred pistol design in two oversized models. Like the existing TOUR SNSR line the new models also feature a soft rubber material for improved feedback and to encourage softer grip pressure for a more consistent stroke. Other features include soft, rounded edges, a paddle front section, and a tapered profile for those that appreciate traditional shape. The two Contour Pro models come in 104cc and 140cc sizes in a black/gray color. Yo, Gear Guy! Is the new Scotty Cameron Phantom line worth the buzz, and when should I replace my wedges? Available in five different models, the new Sink Fit grips from Lamkin are designed to promote a smoother stroke and improved accuracy. Featuring a new contoured shape to promote better wrist alignment, the Sink Fit grips are available in pistol, skinny pistol, and straight shapes to fit a wide variety of player preference and are constructed from a new proprietary Genesis material for improved traction. Each new Sink Fit grip also features Lamkin’s Fingerprint technology with a number of densely spaced micro-textures for a unique feel and improved performance. Designed with a new profile with three sides in the bottom hand area to facilitate a claw-style grip, the Traxion Claw is aimed at minimizing wrist action during the stroke. Other features include SuperStroke’s no taper design for more even grip pressure, Spyne technology for more consistent grip, and a Tech-Port where players can choose to take advantage of SuperStroke’s CounterCore weight system, if they choose. A new x-shaped pattern on the grip is placed in strategic areas to improve responsiveness and feel. Traxion grips are available in 15 different models. Winn’s unique Excel polyurethane material is well known for a soft feel, and tackiness in different playing conditions is key to the feel and performance of the company’s new NTP putter grips. Designed with a consistent no-taper pistol shape, the NTP models (available in blue, black, and red) promote lighter grip pressure and fewer variables in the stroke. The new grips are midsized for added stability. The NTP models also feature new textures made to provide enhanced traction and comfort for a wide variety of players.